I was out looking for a fast dinner one night and picked up some “Moroccan Creamy Soup” to try. Somehow I got the impression that it was a vegetarian soup, but darn, I think it was made with chicken broth. The soup was nevertheless delightful especially in its consistency and the way it was seasoned. The main ingredients were chickpeas and spinach and I could taste cumin and perhaps cinnamon. There were onions and some garlic in the soup as well. The creaminess of the soup I bought came from milk or cream and that didn’t thrill me. So I decided to make my own version of this soup using a vegetable broth, chickpeas, spinach, onions, garlic mushrooms, spices and for added creaminess–a little coconut milk. Luckily I was able to save this last little serving for a photo! Cooked chickpeas in vegetable broth, partially blend leaving at least half the beans intact. I used 2-3 cups of cooked chickpeas. Dice an onion and saute in olive oil with some salt until the onions are translucent and sweet. Continue to saute to caramelize the onions. Add this to the soup. I added some seitan chunks since I didn’t want chicken. Seitan is made by creating a dough from whole wheat flour and then washing out the starch and the bran. The protein (wheat gluten) is left. I will show you how to make this in the near future. Season with salt, pepper, cumin, thyme, allspice and a bit of cayenne. Taste. Adjust. Taste again. Add spinach at the end. I was making about 2 quarts of soup and used about 2 cups of chopped spinach. I garnished my soup with a few slices of Preserved Lemon Rinds, which some of you know I just love to use! If you don’t have this, try a thin strip of lemon peel. I served this yummy soup with a side of olives and a simple salad. It got almost all eaten up before I had a chance to take a picture for this post! I finally ensconced the last little serving to the back of the refrigerator and we had our “photo shoot” today. I wanted to see if I could capture steam in the photo and I did just barely. Can you see it? I can probably because I know it’s there! 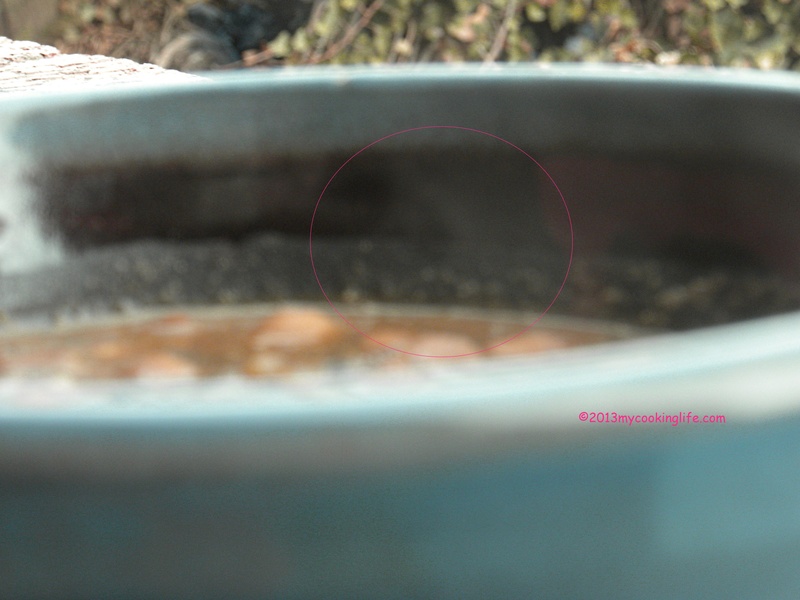 Maybe if I circle my steam in bright pink you can squint real hard and imagine you can see it. Hey! That sort of works! I have not even reached the “amateur” status in food photography just yet but I’m working on it. However my soup cookery is quite good! 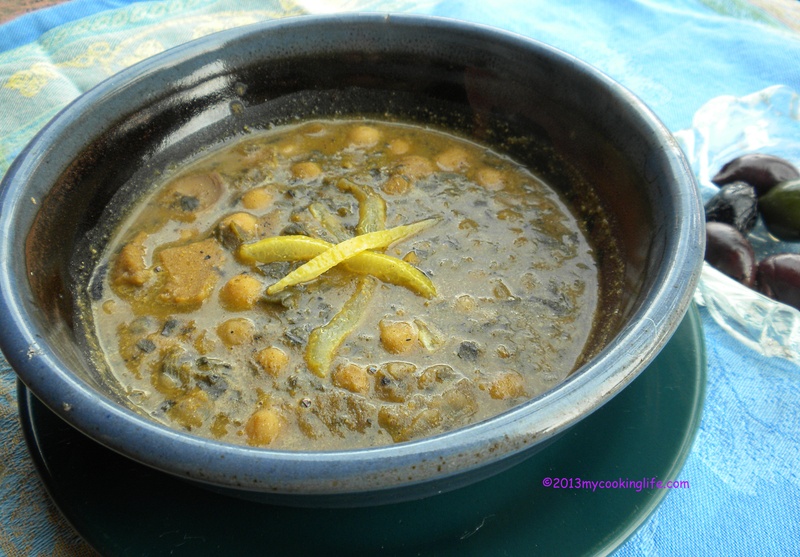 This entry was posted in Cooking, Recipes, Soups and tagged chickpeas, Coconut milk, cooking with spices, cumin, Moroccan style cooking, seitan, Soup, spinach by mycookinglifebypatty. Bookmark the permalink. Definitely going to try this one ~ looks so yummy! Thanks for sharing the recipe.